Custom Sewing Labels. Custom Sewing Tags for Clothing. When you are designing and making your own garments, whether it be for you and your family, or to sell on, adding custom sewing labels is a great way to add a custom finishing touch. These woven sewing tags are ideal to sew on your handmade clothing to both spread your name, and give you a professional finish. Sew in custom sewing labels with care instructions, a logo or even your name or brand name. 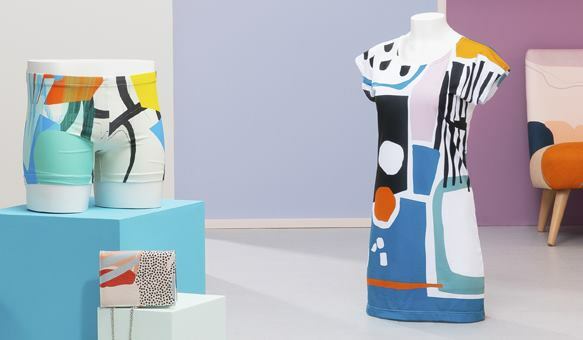 Creating your own clothes can be so rewarding, especially when you look at your completed sewing project and it's exactly as you envisioned it would be. Adding custom sewing labels personalized by you is a great way to make your mark on your completed apparel, similar to the way in which artists would sign the bottom corner of their paintings. 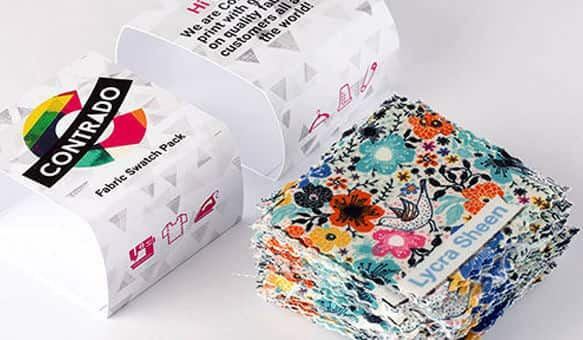 Woven custom sewing tags are printed using eco-friendly inks, which penetrate deep into the fibers of the satin material, permanently bonding them. This infusion technique results in a long lasting print which will not scratch off or peel away, whilst also offering amazing color reproduction and fine detailing. Our custom sewing tags are available in packs of 20, 40, 100 or 200 and in 12 different sizes, you can choose between a folded or flat label style. 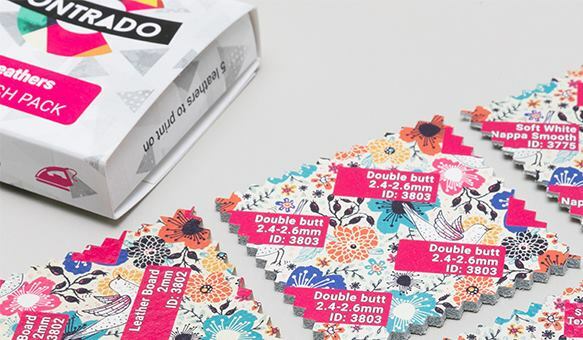 The flat, sew on labels are heat sealed around the edges to ensure no fraying occurs and are available in sizes from as small as 35 mm x 15 mm to as big as 90 x 70 mm. The folded, sew in labels have a closed edge and a cut edge. The cut edge is so that you can sew in your label to your garment. These folded clothing labels can be made as small as 25 mm x 25 mm to 50 mm x 50 mm. There are a few things to bear in mind when creating personalized sewing labels, personalized by you and hand printed to order in our studio. A 10mm seam allowance each cut edge is included on top of each label size. We advise using a 10pt or higher font size, not in a lightweight or fine version of a font, instead favoring standard or heavy styles. The custom sewing labels will have a black or grey thin line printed on them so that we can trim them to size. This will be sewn into your product and will not be visible in the completed label. 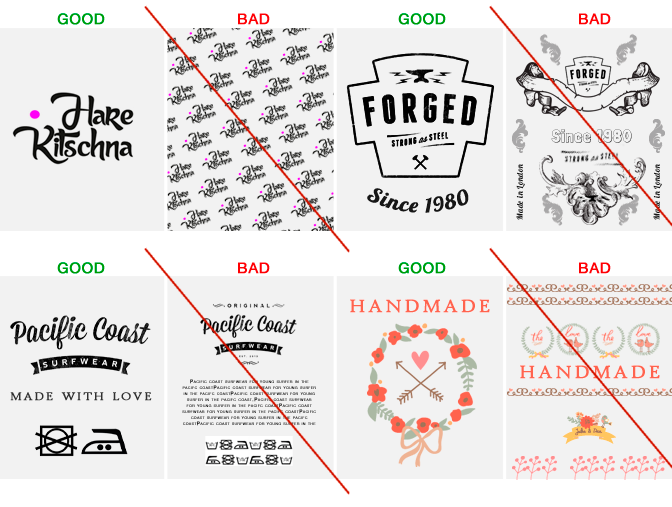 Take a look at some of the examples below regarding how to best layout your design for your custom made sewing labels. Due to the production process that we use, there is the possibility of some seconds or borderline cases of labels. When this occurs we would automatically include these with your order (free of charge) in the hope that you might be able to make use of them. We feel that this is a much better solution than sending them straight to landfill. If you notice these cases within your order, it's worth checking as it's likely that they have been sent as extras rather than as part of your order. Please note: If you opt for folded labels, these will not be pre-folded. Our fabric labels have a permanent wash fast print. The material is strong, yet soft, and will easily last the life of your garment or accessory. To ensure your label stays in tip-top condition we recommend ironing at 86°C maximum. Cool washing, 104°F maximum. Tumble drying on low heat. Exceeding these settings can result in color bleed. Wonderful work and delivery! I order labels for my clothing and they are perfect! Prefect product! Perfect quality! Perfect price! Perfect delivery time!Definitely ordering again! Satisfied The product was exactly what I was looking for. Terrific labels Easy to use interface. Great quality of the initial product and wonderful outcome on the final printed labels. Excellent service. Already recommended your company to two other individuals. Thank you. What information is good for the labels? Your custom made sewing labels in smaller sizes are great for putting your logo on brand name onto to create some real brand recognition. Putting your mark against your work is a great way to take pride in what you do, and spread the word. What else would I put on the labels? If you opt for smaller custom sewing labels then you won't be able to get much more than a name and/or logo on there, but the larger labels can be used to add things like your website address and even care instructions for the fabrics that you've used in your project. Where would I find the icons for the care instructions? To make things as easy as possible for you, in our design interface, you can add icons to custom sewing tags personalized by you from our image library. In the library, there is a tab called washing instructions, and you'll find a number of the common care instruction icons in there.